“Our next First Friday is September 3 and the street will be closed for the festivities. We extend a big thank you to Providence Hood River Memorial Hospital for sponsoring July, August and September’s street closing for our First Friday event. Providence will have its Mobile Health unit available to the public during First Friday, located at the corner of 3rd and Oak Street. Naked Winery will have Hood River’s local Tess Barr is true blues from 8PM to 11PM. A power house voice and backed by a rock solid band. Melika kicks of their HUGE Labor Day Sale, up to 70% off. Parts + Labour will have musician KEVIN HOLMAN on acoustic guitar and Cor winery for tastings of their wine collections. Small Planet Trading hosts artist Diane Gadway showing her unique line of jewelry made from re-purposed materials. Gadzoolry is fun, funky and functional. Meet the artist between 6 – 8 pm and enjoy Fair Trade and local munchies while you shop. Columbia Center for the Arts will have Plein Air Gallery Show & Opening Reception: 6 to 8 pm – Free; Gallery Show: Daily, September 3-26, 11 am – 6pm; Artworks created during the five-day Paint-Out will be available for purchase and selections of writers’ works will be on display. The Enchanted Alpaca is hosting Jose Marroquin, Peruvian Photographer, with his very special exhibit “Sharing the Magic of the Andes.”. Also hosting Patricia Shypertt, local Hat Milliner Extraordinaire! Cascade Acupuncture will have its Grand Opening of the new Chinese Herbal Pharmacy! The grand opening is from 5:30 to 8:00 pm at 104 5th Street, in Hood River. There will be raffles, free chair massages, free usable tote bag, free champagne, free Greens First and Dream Protein shake samples, appetizers by Knead bakery and 15% off selected products. IPS/2nd Wind Sports Snow Rail Jam on 4th Street between State and Oak, adjacent to The British Pub. It will run from 7 to 10 p.m. Set-up starts at 5 p.m. Volunteers are welcome to help shovel snow, hauled down from Timberline Lodge at Mt. Hood. Volunteers are needed as well to remove snow, after the event. During the Rail Jam, athletes will be hitting the sliders and judged on style, technique and “Wow!” factor. Hood River’s own Sunderland will be playing live during the rail jam, and there will be a breakdance demo outside the pub. After the Snow Rail Jam, stay for the premiere of the new snowboard flick filmed by Hood River locals: “it’Z ALL HOOD” at 9 p.m. outside The British Pub. There is an entry fee of $25 for athletes who get approval to participate by Wally Inouye of IPS and/or Pepi Gerald of 2nd Wind Sports. The entry fee may be waived if the participants help with set-up and take-down. “At the intersection of Third and Oak, Providence will have its Mobile Health Unit on location. Providence staff will offer free wellness checks (also in September). Wellness checks include glucose, cholesterol, blood pressure checks, height, weight and body mass index (BMI) testing, which should give a good baseline for overall health. A variety of freebies are also available — sunscreen, band aids, Frisbees, measuring tapes, sewing kits, pink ribbon key chains, etc…. as supplies last. Providence also will provide buckets of chalk so kids can create chalk art on sidewalks and street surface. That’s Swank! hosts musicians Paul Crouch & Shane Lebcock playing live blues & rock music. Local middle school students created handmade duct tape wallets and accessories for sale at the store. Snacks, wine and store’s first clearance rack. Bambinos Bounce House features non-profit groups offering face painting, a dunk tank and more. BCI Insurance and the Hukari Animal Shelter will have several dogs available for adoption. Watch for “adopt me” vests or learn more about dogs available for adoption online. Parts + Labour will feature singer-songwriter Alex Ellison and jewelry art by MinK. RE/MAX River City will feature Gorge artist Karen Watson, from Aug. 6 through September. Watson is known for her beautiful pastel paintings and has lived in Hood River for over 20 years. Columbia Center for the Arts will have its fundraiser raffle car — a 2010 Honda Insight LX Hybrid — available to view near 3rd and Oak Street. Raffle tickets will be on sale for $40 and only 1,500 tickets will be sold. 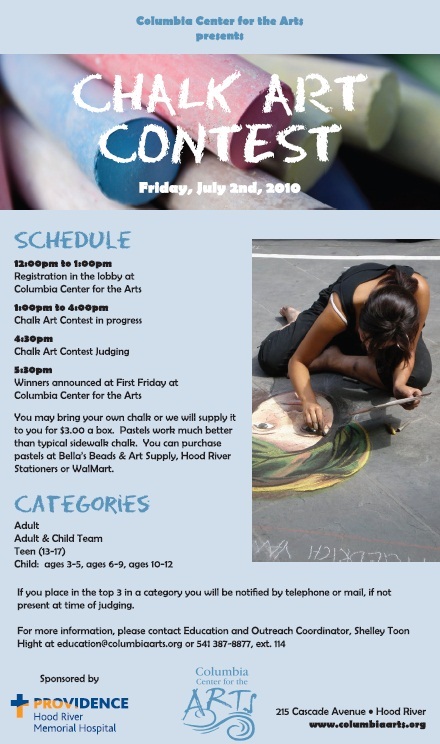 The drawing will be held on October 1, 2010. For more First Friday events, click here. During First Friday in May, the Buzzer popped in to the new location of Footwise, at 413 Oak Ave., and caught other visitors enjoying the new digs. Patrick Quigley, who does sales for Express Color, first shared his appreciation. Store sales rep Greg Morris next shared his excitement. Winemaker Rich Cushman of Viento wines, and Kathy Watson of Nora’s Table, chatted in the background, totally ignoring all the awesome footwear decorating the walls. First Friday for June is (duh) June 4, from 5 to 8 p.m. (or later, for dining establishments). Reminder: There will be no street closures for First Friday in June. Street closures will be in place for July, August and September (which leads into the Labor Day Weekend). See you downtown on Friday.